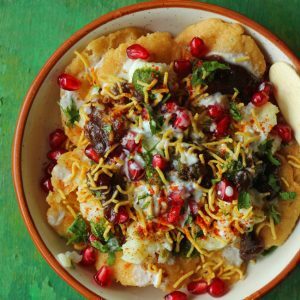 Chaat is a quintessential part of Indian street food. The evening snack fare in India is so incomplete without a plate full of vibrant, flavoursome chaat. 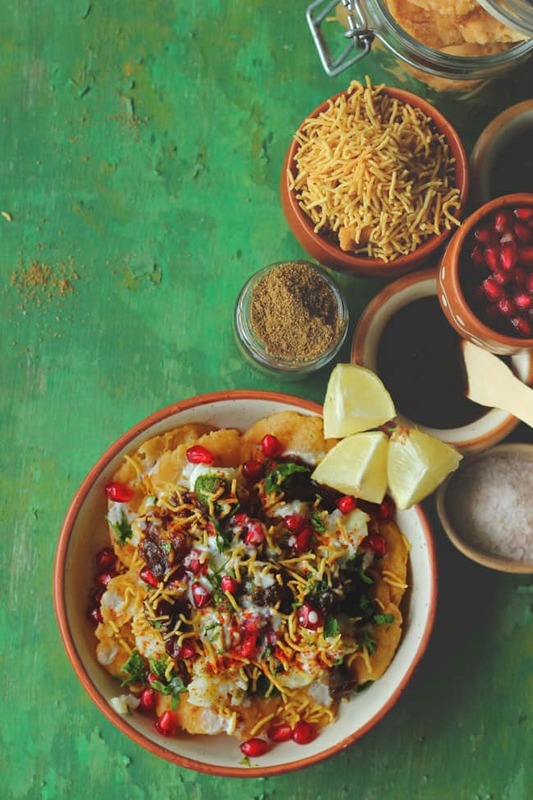 From dahi bhalla, dahi papdi to Chinese bhel puri, the variety of chaat served in India is just overwhelming. 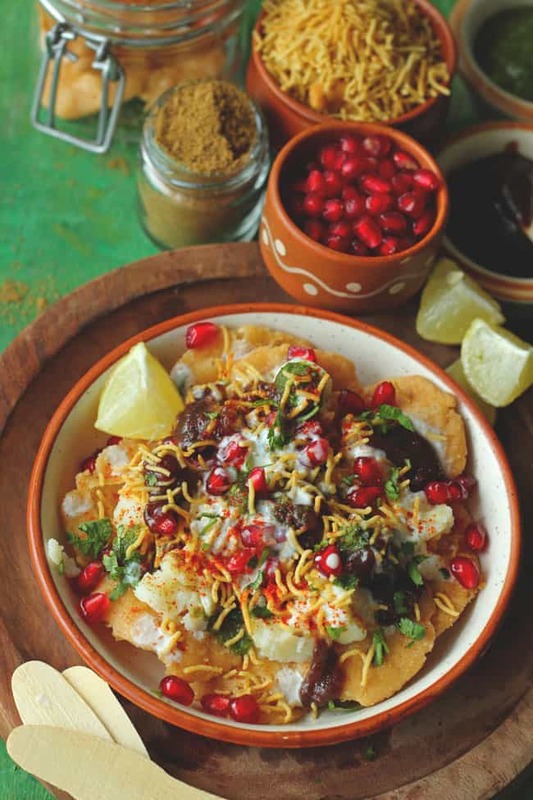 We too have many Chaat favourites but one, in particular, is my love – Dahi Papdi. Or as most of us call it – papdi chaat. Whatever be the name, a papdi chaat is always the crisp, crunchy savoury crackers loaded with sweet and spicy toppings. Each bite of papdi chaat is a real outburst of flavors. That reminds me, hope you have tried our coolest Bread Basket Chaat Recipe? If not, then you must watch the video now. How To Serve Papdi Chaat? I hate confining myself to the kitchen while the party is in full swing. So to engage my guest in the Papdi plating process, I set up a tiny Chaat station in the dining area. Arrange all the chaat essentials in the bowls. And while engaging in an interesting conversation about the food assemble the papdi chaat. Or let your better half take charge of the Chaat corner while you concentrate on other snacks. It is one of the coolest ways to serve Papdi Chaat during a party. Planning a Chaat Party? Try these recipes – Dahi Bhalla, Bread Basket Chaat, Aloo Tikki, and Chinese Bhel Puri. How To Make Chaat Without Homemade Papdi? Talking about the Papdi, I prefer making them from scratch at home. Reason? I love doing that. But if you do not have enough time in hand to make papdi, use the ready-made ones. Nowadays, there are a lot of good quality papdi available in the supermarket. Pick any one of them and just assemble the toppings. I know. 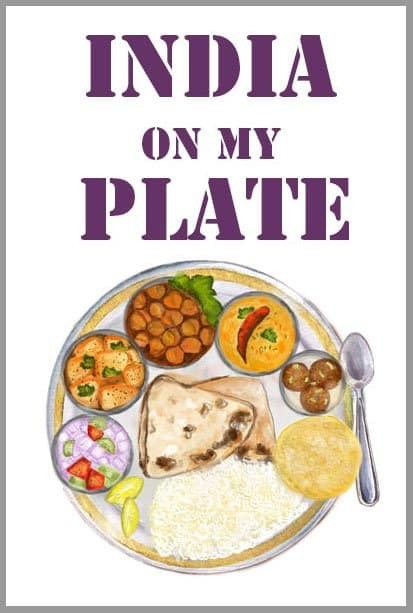 Most of you will be like – why can’t we just eat Papdi Chaat at the street side food joint? Because making your own customized platter of papdi chaat at home is so much fun. It fills you with a gratifying feeling. And imagine, the tons of compliments you will receive while the guests stuff their mouth with the homemade papdi chaat. 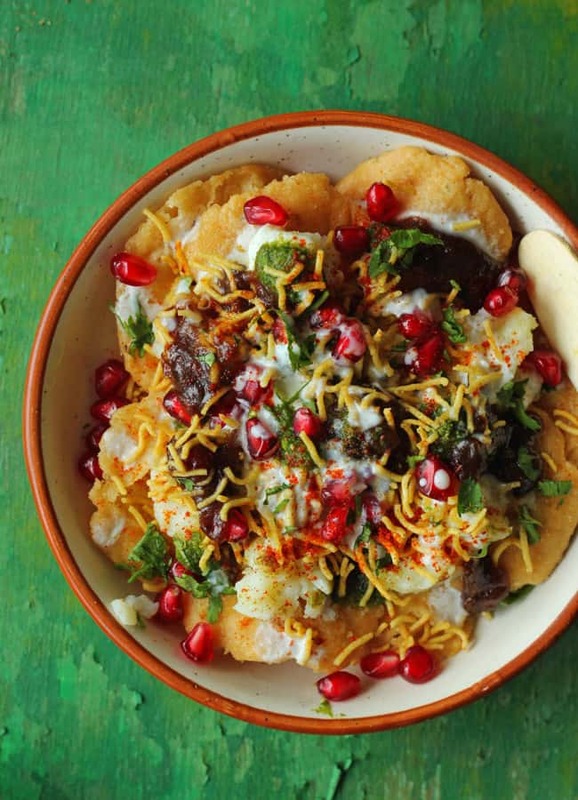 Chaat is such a quintessential part of Indian street food. Find how to make dahi papdi chaat in few simple steps at home. Combine yoghurt, salt, cumin powder, red chilli powder in a bowl. Whisk until yoghurt is smooth and creamy. Set aside. Arrange the 5 – 6 papdi in a plate. Make sure they are not overlapping each other. Add approximately a tablespoon of boiled potato on top of each papdi. Next drizzle a tablespoon of yogurt on each papdi. Now add both the chutneys on each papdi as per your taste. Sprinkle chaat masala, sev and pomegranate pearls. Dahi Papdi Chaat is ready. Serve it immediately else papdi turns soft. I m Chaat Lover,so i will try this for sure.Your explaintion was perfect.Thank you sharing this with us.